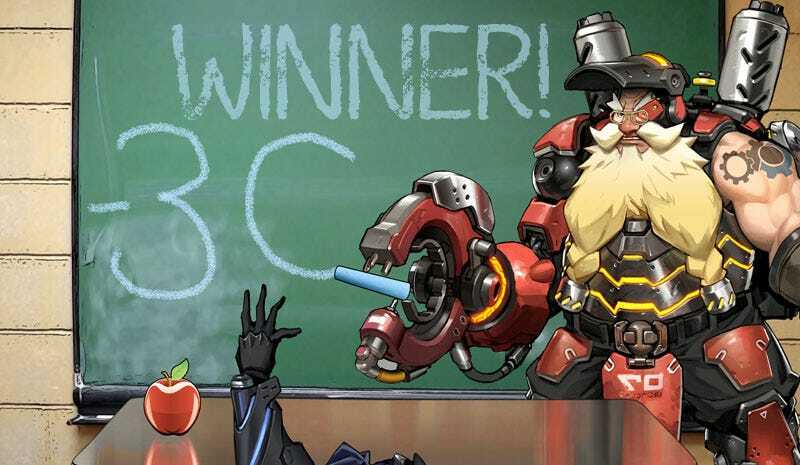 Kotaku 'Shop Contest: This Is A Job For Torbjorn: The Winners! The dwarven spectacles and relevant curriculum won Mrichston the Gold ‘Shop Contest Star Sticker, which is a thing I just made up. Fahey asked you to envision new careers for Overwatch’s dwarf with a robotic arm, since console nerfs are making him 30 percent less appealing. In addition to changing oil while insulting Texas drivers, there were dozens of great opportunities for Toblerone. Err, Torbjorn. Here’s Mrichston’s entry as it originally appeared. Scroll on down to see more winners; they appear in the order I saved them in, which is nonsensical. Dispenses water and dating advice to awkward co-workers. Good stuff, cinerius. All hail Bane for this one, and all hail His Grace, Torbjorn of House Sweden, First of His Name, King of Defense and the Ironclad Guild, Lord of the Turrets, and Protector of the Molten Core. “YOUR AIR FILTER IS AT 53%, YE DAFT BULLET SPONGE.” —Pete, who made me choke on my drink. “Will it be done in time for Christmas, Santa?” “*chuckles* When it’s done.” Thanks, Tofu Brain. Torbjorn would’ve known to take the damn eagles. This one’s from Bobblers. As commenters noted, he doesn’t even need to kneel! Win win by SteveFish. He’s giving it all he’s got. Thanks for an image all the bleach in the world can’t erase from our minds, At Risk Asterisk. Putting Bender out of a job. Again. ‘Grats, OCELOTR. Please give that poor guy some novocaine, DistractedObserver. I’m not sure this qualifies as a job, but new relationships take a lot of work, so it makes the cut. Thanks for making us believe in love again, BRUXXUS. Some assembly required. Good on you, Flawed_Logic. Jedi Master Torbjorn’s claw makes Jedi Master Luke’s silly robot hand jeals. (I recognize his lightsaber is red, but I refuse to believe he’s gone dark side). Kudos, BobbyRossMcGee. The engineer Nasa didn’t know it needed, until RecklessWanted showed us the way. “Leave this to an exp—yuh. Uh huh. Did ye turn it off and turn it back on again?” from graham2k. “I’m Torbjorn, and I start each day with Toblerone!” Taking on corporate sponsors qualifies as a job, we’d say, and Mack agrees. I want votes on which of them has the most spine-chilling expression. Ready, go, and thanks BlueMonk. Pro tip: instead of buying DIY tools, just convince him to follow you home and build it for you. From IRarelyComment. Blood, sweat, and shoulder-mounted speakers make the finest maestros, Galogon. This corporate sponsorship paired with his actual nerfing gave me the chuckles, Drab Emordnilap. If your entry isn’t here, never fear: Torbjorn has no limits, and your entry was awesome. We’re posting another ‘Shop Contest tomorrow, unless something weird happens. Or if Fahey forgets.